On Election Day last week, I opined that we might be a little too accommodating of folks who didn’t speak English since signs directing people to ‘Vote Here’ were also in English, Spanish, Korean and Chinese. 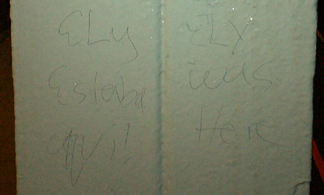 Today I came across graffiti designed to inform me where Ely was. Where Ely was happens to be a subway platform. Hardly an achievement on the scale of, say, Mount Everest. And since I happened to be there too it wasn’t all that impressive. But what struck me was that Ely chose to deliver his message in two languages. Presumably so everyone from a Wall Street banker to an illegal immigrant from Honduras could know where Ely once was. I admire Ely’s gusto. I guess there’s no stopping the multilingual juggernaut.